In this article, we will create a web-based dashboard for a Docker installation using a number of different frameworks and technologies, both front-end and server-side. In this article, we are going to use a few different technologies together to build something which, after a bit more elaboration, might actually be useful! We will be creating a web-based dashboard for a Docker installation using a number of different frameworks and technologies, both front-end and server-side, enabling some administrator to monitor running containers, start and stop existing containers, and create new containers based on existing Docker images. There is a wide scope for elaboration here, of course, but I'll leave that as an exercise for you, the reader. Hopefully, this article will set you off on the right foot with a good overview of the relevant technologies, enabling you to add even more value to the product! This is a quick preview of what the app looks like when it's finished. It's essentially a page that displays two lists of Docker containers: those that are currently running, and those that are stopped. It allows the user to start and stop these containers, as well as start a new container from an existing image by clicking the 'New container' button. If you want to explore the finished product as a reference (finished as far as the article is concerned!) then you can fork the code on Github.com. Let's have a look at exactly what we're going to be using, and why. I'll go through the prerequisites and installation requirements in a bit. Docker: This uses container technology to reliably run apps and services on a machine. 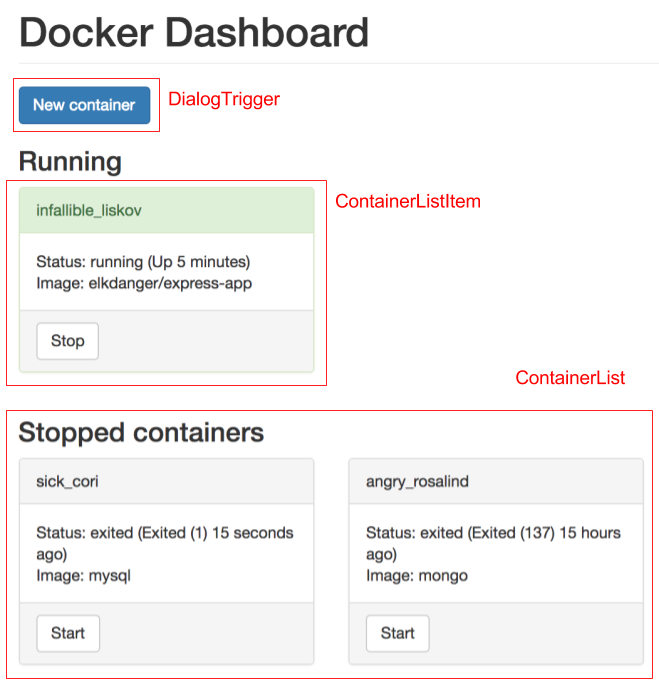 The app interfaces with the Docker daemon through the Docker Remote API. More on this later. Socket.io: Provides us with a way to communicate in real-time with the server and other clients using WebSocket technology, gracefully degrading on older browsers. ExpressJS: Used to serve our web application. Bootstrap: To provide something decent looking - a problem I know all of us programmers endure! There are a few more minor ones, but I will cover those as we come to them. As this is going to be a slick-looking dashboard for Docker, we need to make sure we have Docker installed (if you don't already). Head to docker.com and download the latest version of the client for your operating system. If you've never heard of or used Docker before, don't worry about it too much, but it might be worth following through their getting started tutorial for Mac or Windows or Linux. To make sure your Docker installation is up and running, open up a command prompt and type: docker -v. You should see some version information repeated back to you; mine says Docker version 1.12.5, build 7392c3b. If you can't see this or you get an error, follow through the installation docs again carefully to see if you missed anything. Keep the command prompt open - you're going to need it! To write our app and serve the web interface to the user, we're going to use NodeJS. This has a number of libraries and frameworks which will make the job very easy for us. Node, version 6.3.1 was used to build the demo app for this article, so I would urge you to use the same version or later if you can, as there are some language features that I'm using which may not be available in earlier versions of the framework. You can grab the 6.3.1 release from their website, or simply grab the latest release from their main downloads page. You can also use something like NVM if you want to mix and match your versions for different projects, which is something I can recommend doing. It should ideally be version 3 or greater. We will need to install the TypeScript compiler for our application to work; luckily we can do this through NPM. Which should again echo a version number back to you (I'm using 2.0.10). This has installed webpack into our global package repository on our machine, giving us access to the 'webpack' tool. First of all, create a folder somewhere on your machine to house the development of your Docker dashboard, and navigate to it in your command line. We'll go through a number of steps to set this folder up for use before we start coding. This will ask you a number of questions about the project, none of which are terribly important for this demo, except that the name must be all lowercase and contain no spaces. Once that has finished, you will be left with a package.json file in your project. This is the manifest file that describes your node project and all of its dependencies, and we'll be adding to this file shortly. Next, we'll get the basic web server up-and-running, which will eventually serve our ReactJS app to the user. This simply gives us a basic template for the front page of our app - we'll be adding to this later! The prompt should tell you that it has managed to start the site on port 3000. Browse there now and make sure we can see our default index page. If not, check both the browser window and the console to see if Node has spit out any useful errors, and try again. Right now when you make changes to the site you will be forced to stop and restart the node app to see your changes to NodeJS code take effect, or re-run the webpack command whenever you make a change to your React components. We can mitigate both of these by causing them to reload themselves whenever changes are made. To automatically reload your NodeJS server-side changes, you can use a package called nodemon. Install it using npm install -g nodemon and then start your node app using nodemon server.js. You'll notice that, as you make changes to your code, the app will automatically restart. concurrently "nodemon server.js" "webpack --watch"
"start": "concurrently \"nodemon server.js\" \"webpack --watch\""
And then whenever you want to start your app and have it automatically recompile everything, you can simply run npm start! The main body of our client application is going to be constructed using React and TypeScript, which means we need to spend a little more time setting up one or two more tools. Once we set up a workflow for compiling the first component, the rest will easily follow. Firstly, let's have a look at how we're going to structure our React components. They will all be housed inside an 'app' folder, with the smaller components inside a 'components' subfolder. index.tsx is essentially an entry point into our client-side app; it binds the React components to the HTML Dom. If you're using the excellent Visual Studio Code you'll notice that it will immediately start throwing up IntelliSense issues, mainly because it doesn't know what 'react,' 'react-dom,' and our application component is. We're going to use Webpack and TypeScript to fix that! The entry key tells Webpack to start processing files using the /app/index.tsx file. The output key tells Webpack where to put the output files; in the /public/js folder with the name bundle.js. The resolve key tells Webpack which extensions to pay attention to when resolving module. The main parts of this configuration are the module, target and jsx keys, which instruct TypeScript how to output the correct code to load modules in the right way, and also how to deal with the React JSX syntax correctly (covered later). Let's see what state our Webpack set up is in at the moment. From the command line, simply type webpack to start compilation. (1,24): error TS2307: Cannot find module 'react'. (2,27): error TS2307: Cannot find module 'react-dom'. (3,30): error TS2307: Cannot find module './components/app'. (6,5): error TS2602: JSX element implicitly has type 'any' because the global type 'JSX.Element' does not exist. Essentially, it still doesn't know what 'react' is, so let's fix that now! At the moment it does nothing except print out 'Docker Dashboard' in a header tag, but it should at least compile. We'll flesh this out much more later on! For now, though, you should be able to run the webpack command again and have it produce no errors. Now, you should be at the point where you can run the site using node server.js, browse to http://localhost:3000 and view the running website. If you can see 'Docker Dashboard' written using a large header font, then you've successfully managed to get your Webpack/TypeScript/React workflow working! Congratulations! Now let's flesh out the actual application a bit more and add some real value. What we have now is a server-side application which acts as the backbone of our React app. Now that we have done all that setup and configuration, we can actually concentrate on creating the React components that will form the application's interface. Later on, we will tie the interface to the server using socket.io, but for now let's start with some React components. The DialogTrigger component displays a button which can trigger a Bootstrap modal dialog. The ContainerItem component knows how to display a single Docker container, including some info about the container itself. The ContainerList displays a number of ContainerItem components. 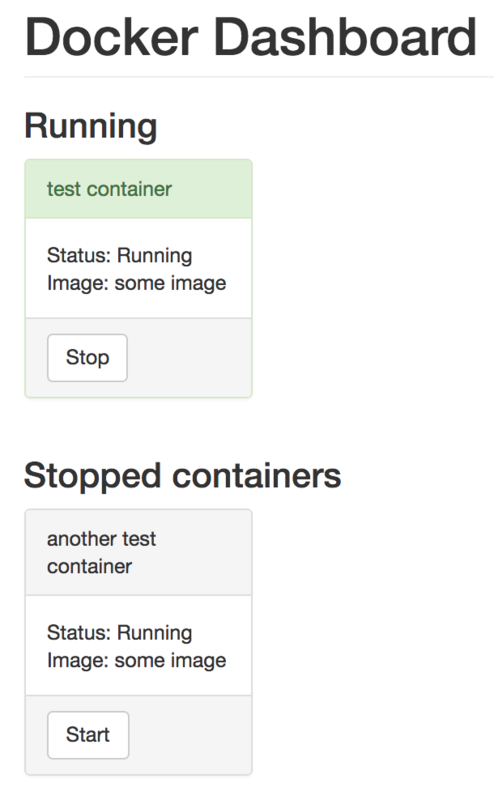 There are two ContainerList components here - one for running containers, and one for stopped containers. Here we have defined a component that can render a single container. We also declare an interface that has all of the properties of a container that we'd want to display, like its name, image, and current status. We define the 'props' type of this component to be a Container, which means we can get access to all the container information through this.props. The goal of this component is to not only display the current status of the component but also to handle the start/stop button - this is something we'll flesh out later once we get into the socket.io goodness. The other interesting thing this component can do is slightly alter its appearance depending on whether the container is running or not. It has a green header when it's running, and a gray header when it's not. It does this by simply switching the CSS class depending on the status. Classnames is not strictly necessary but does provide a handy API for conditionally concatenating CSS class names together, as we are doing here. This one is a little simpler as it doesn't do too much except display a bunch of ComponentListItems in a list. The properties for this component include an array of Container objects to display and a title for the list. If the list of containers is empty, we show a short message. Otherwise, we use map() to convert the list of Container types into ContainerListItem components, using the spread operator (the ...c part) to apply the properties on Container to the component. We also give it a key so that React can uniquely identify each container in the list. I'm using the name of the container, seeing as that will be unique in our domain (you can't create two Docker containers with the same name, running or not). So now we have a component to render a container, and one to render a list of containers with a title, let's flesh out the App container a bit more. Now we need to create some state for this application component. The state will simply tell us which components are running, and which are stopped. We'll use this state to populate the two lists of containers respectively. Lodash is a very handy utility library for performing all sorts of operations on lists, such as sorting, filtering - and in our case - partitioning! Now in our state, we should have two lists of containers - those that are running, and those that aren't. Let's have a look at the Docker and socket.io side of things now, and replace those dummy containers with some real data! We're going to provide the client with a few methods; getting a list of containers, starting a container, stopping a container, and running a new container from an existing image. Let's start with the container list. This starts socket.io listening for connections. A connection will be made when the React app starts; at least it will be when we put the code in a bit later on! Whenever we call refreshContainers(), the Docker API will be used to retrieve the list of all of the containers that exist on the current system (running or not), which will then send them all using the 'containers.list' message through socket.io. Notice, though, that we're sending the message through the main ioobject rather than through a specific socket - this means that all of the clients currently connected will have their container lists refreshed. You will see why this becomes important later in the article. This is where we extract out properties such as the name, image, status, and so on. Any other properties that you want to include on the UI in the future, you will probably read inside this function. Right now, you should be able to start your app and have it display a list of the running and stopped Docker containers on your machine! Being able to start and stop a container is merely an extension of what we've already accomplished. Let's have a look at how we can start a container when we click the 'Start' button. We are going to handle the 'click' event of the start button from inside the React component. Inside the click event, we're going to send a message to the socket running on the server. The server will receive the message and tell Docker to start the appropriate container. When the container starts, the server will dispatch a message to all connections with a refreshed list of containers. Here we simply get a container from Docker using the ID that we get from the client. If the container is valid, we call start on it. Once start has completed, we call our refreshContainers method that we already have. This will cause socket.io to send our current list of containers to all the connected clients. The functionality for stopping containers that are running is done in much the same way: we send a message through socket.io to the server with a 'containers.stop' message, the server stops the relevant container, and then tells everyone to refresh their container list. The code looks strikingly similar to the start code, except we stop a container instead of starting it. If you run the app now, you should be able to start and stop your containers! Before we head into the last section, now would be a good time to add a quick feature that will automatically refresh our container state. As awesome as our new Docker dashboard is, containers can be started, stopped, created, and destroyed from a few different places outside of our app, such as the command line. It would be nice to reflect these changes in our app too. A quick and easy way to achieve this is to simply read the container state every x seconds, then update our clients. We already have most of the tools to do this, so let's implement it! Now, once your app is running, dive into the command line and stop one of your containers using docker stop <container id or name>, and you should see the container stop inside your dashboard too! Furthermore, thanks to the power of socket.io, you should be able to open your dashboard in multiple browsers and see them all update at the same time. Go ahead and try browsing your dashboard on your mobile device too! In this final section, we're going to explore how we can start brand new containers from existing Docker images. This will involve a couple of new React components, a Bootstrap Modal popup, and some more interaction with socket.io and the Docker API. A 'modal' component, which is a generic component for creating any modal dialog. A 'new container modal' component, which is based upon the generic modal component for showing the new container-specific UI, as well as handling validation. A 'dialog trigger' component which is used to show a modal dialog component on the screen. Let's start with the generic component, seeing as our modal for creating a new container will be based upon this one. We're making a generic component just as an exercise to show you how you can extend such a component for multiple uses. For example, later you might go on to create a dialog to accept an image name that will be pulled from the Docker hub - you could also base that modal upon this generic component. We must take an ID and a title, but we can also accept some text for the button on the dialog and also a handler for the button click so that we can define what happens when the user clicks the button. Remember that this component is designed to be used in a generic way - we don't actually know what the behavior will be yet! Most importantly, use the component called this.props.children for the modal body. You'll see why this is important in the next section, but basically, it allows us to render other components that are specified as children of this component. More on that later. Also, note the onPrimaryButtonClick handler; when the button is clicked, it delegates control to whatever is using this component, but it also inspects the return value from that call. If false is returned, it doesn't automatically close the dialog. This is useful for later when we don't want to close the dialog in the event that our input isn't valid. One last thing before we move on - when this component compiles, you'll probably find that TypeScript will complain that it can't find $, which is true since we haven't imported it. To fix this, we need to simply install the typings for jQuery so that it knows how to resolve that symbol. You will also need to install the types for the Twitter Bootstrap so that it knows what the bootstrap-specific methods and properties are. Note that we're importing our generic modal as Modal, allowing us to make use of it in this new modal component - but more on that shortly. For the properties, we allow an ID for the component to be set - this will make sense soon when we create our last component, the 'modal dialog trigger.' We also take a function that we can call when the name of an image to run has been entered. For the state, we're going to record the name of the image that was entered, and also some basic form validation states using the isValid flag. Hopefully, now you can see how the component is constructing using the generic modal component we created earlier. In this configuration, the Modalcomponent acts as a higher-order component, wrapping other components inside of it, instead of our new component inheriting from it as we might have otherwise done. We apply a class to the div that wraps the form elements that is derived from our isValid state property; if the form isn't valid, the input box gets a nice red border, and the user can see they've done something wrong. We specify a handler for the textbox's 'onChange' event, allowing us to handle and record what the user is typing in. We specify a handler for the generic modal's button click - when the user clicks that button, our new component is going to handle the event and do something specific to our needs. We'll come back to this in a minute. All of the form behavior is captured here. As the user is typing into the box, we record the input value into the imageName state property, and also determine whether or not it's valid; for now, it's good enough for the image name to have at least one character. This should be fairly straightforward - we simply say that if the state of the component is valid, and the onRunImage handler has been defined, we call it with the name of the image that the user typed in. We also return a value which indicates to the generic modal component that it should close itself. This happens to just be the same thing is the value of the isValid flag. That's it for this component - let's create a trigger component so that we can open it! There's no need to import the generic Modal component, as that will be done by the NewContainerDialog component; we're not going to use it directly here. Note how the ID property of DialogTrigger is the same as the ID property of NewContainerDialog - this is necessary in order for the trigger to understand that this is the dialog it needs to trigger. Here we call out to the Docker API and its convenient createContainermethod, passing in the image name that the user typed in. This will not pull new images from the Docker Hub - it will only start new containers from existing images that exist on the local system. However, it can certainly be done - I'll leave it as an exercise for you, the reader, to complete in your own time. If we're able to create the container, we'll start it. Remember our timer that we created earlier? Once the container starts, that timer will pick up the new container and display it to all the clients that are connected! Here we simply throw an alert if Docker encounters an error running the image. Armed with your new-found React knowledge, I'm sure you can now come up with some fancy UI to make this a lot prettier! 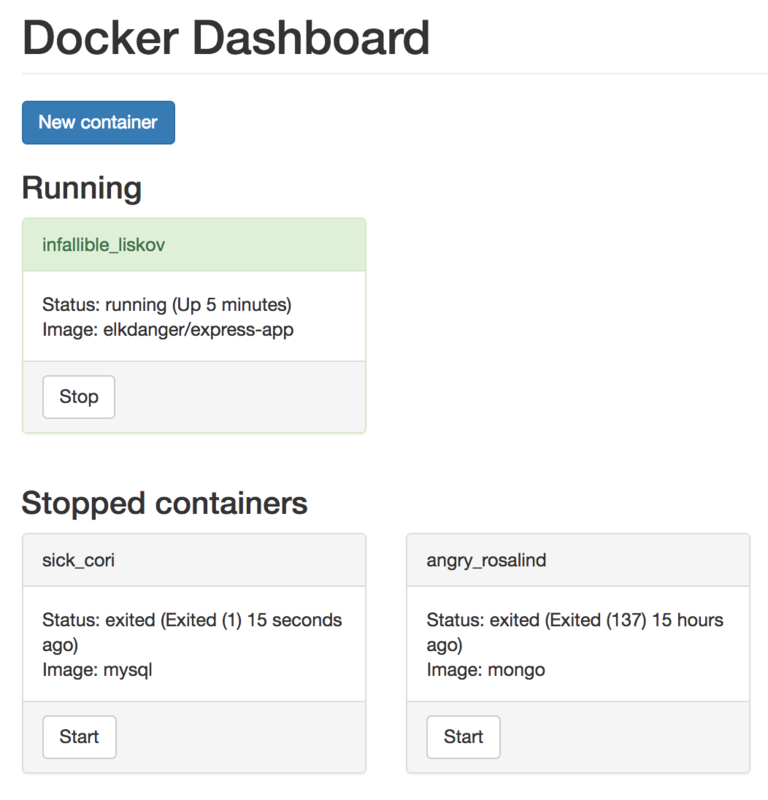 By now you should have a useful, but somewhat basic, Docker dashboard, and hopefully, the journey has been worth it! With all the socket.io goodness, be sure to play around with loading your app from multiple sources, like your desktop browser and mobile phone, and watch them all keep in sync! Using the Docker API to pull images instead of simply running them. Using the Docker API to stream the container logs to the client through Socket.io. Extending the container dialog form to include options for port mapping, volumes, container name and more! Published at DZone with permission of Steve Hobbs , DZone MVB. See the original article here.